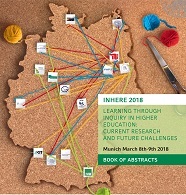 INHERE 2018 aims at examining and confirming the empirical basis for the claims (and arguments) brought forward for learning through inquiry. An integral part of the conference will be a discussion of the scientific findings from three years' work by the research project ForschenLernen. We cordially invite you to the conference and look forward to welcoming you to Munich! Thanks to the generous funding provided by the Federal Ministry of Education and Research (BMBF), there will be no registration fee for conference participants.